Washington wolf (photo by WDFW). Wolf recovery is in full swing in Washington after their systematic extermination in the early 1900s. 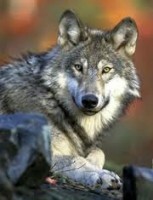 Idaho and British Columbia are the source populations for Washington’s wolves. End-of-year 2017 counts document that there are at least 124 wolves in the state across 22 packs. Click here to see a map of wolf pack territories in Washington. While wolf recovery is going strong in Washington, challenges remain. Poaching is an issue, as is lethal control. In the summer and fall of 2012 the Washington Department of Fish and Wildlife killed 7 out of 8 wolves from the Wedge Pack in remote northeastern Washington after a series of livestock losses. A similar setback to the population occurred after the state killed most of the Huckleberry Pack in 2014. WDFW failed in its responsibility to these wolves in many ways, including not following their own depredation protocols, not insisting that the public lands rancher take meaningful preventative measures, and being too responsive to the livestock industry in general. With these lethal control actions acting as motivating catalyst, ensuring Washington wolf recovery continues on an upward trajectory is receiving our full attention.